Racing Greyhounds are starved, abused, abandoned, sold for experimentation, and slaughtered because tracks are closing. Help us rescue, provide medical care, and adopt them. Help Save the 15,000 Racing Greyhounds at RISK! and destroy the Greyhound Industry. Whether you live in Florida or another state, YOU CAN HELP by SPREADING THE WORD about their plight through Social Media and friends, money for their medical care, Families for Adoptions, Supporters to Symbolically adopt them, Foster homes, and volunteers to help in your communities. Saving their lives is our TOP PRIORITY. Please go to our website, sign up NOW and get the full story. We named our poster Greyhound HOPE. She was one of the "unlucky" greyhounds that had no place to go when she retired. I made her a promise that someday I would find a way to give every retired racing greyhound a home. And for 23 years, and 10,000 greyhounds later, YOU have been helping me keep that promise. We became the VOICE OF THE GREYHOUNDS. NOW they URGENTLY are calling to animal friends everywhere for YOUR help. Please join us and stop this potential tsunami of homeless and dead greyhounds today. Preserve the Legacy of the Greyhound Breed. Thank you for choosing the Greyhound Foundation Charity this year, #10471. Help save lives of 15,000 racing greyhounds, babies & mamas! 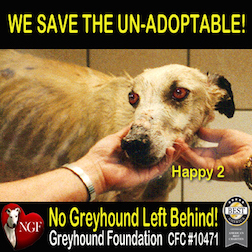 Help spread the word and save over 15,000 greyhounds at risk in Florida. Will they live or will they Die? The choice is yours! foster, or provide transportation in your area. Preserve the legacy of the Greyhound Breed. Visit our website and sign up to show your love NOW!